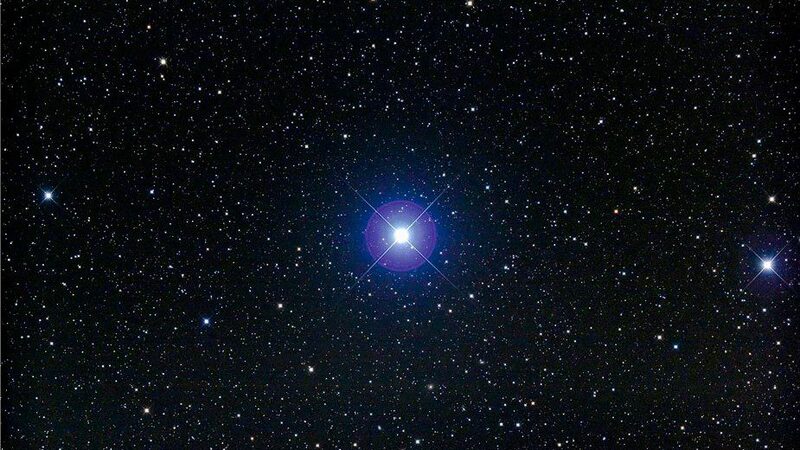 Fixed star Castor, Alpha Geminorum, is a 1.9 magnitude complex multiple star system made up of six individual stars, located in the head of the Northern Twin of Gemini Constellation. Although it is designation α, it is actually fainter than β Geminorum (Pollux). Castor and Pollux were the Two Gods of Sparta in Greece, sons of Leda, Queen of Sparta. Their Roman equivalents are Apollo and Hercules. Pollux (Hercules) comes from the Greek Polydeuces, hence he was the Boxer. Pollux was the immortal twin and a skilled Horseman. When Castor was killed in battle, Pollux asked his father Zeus (Jupiter) that he die to forever be with Castor. 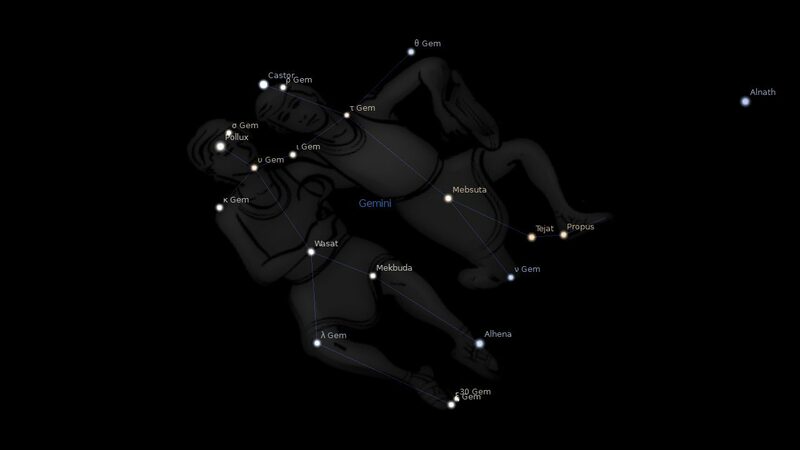 Zeus killed Pollux with a bolt of lightning and placed the twins in heaven as the constellation Gemini. Castor, in the Twins and together with Pollux, is called “Thiassis eyes”, a name given to these two stars by the ancient Germans. The Babylonians considered both stars as a pair belonging together, as “herdsman and warrior”. The Phoenicians recognized in the twin stars, helpers if in peril on voyages at sea. Castor, α Gemorium, was the horseman of the twins, just as Abel was the animal keeper, and he shared Abel’s fate of being killed by his brother. Pollux got his brother drunk to make the task easier, or as one wag among classical astrologers put it: He got Castor oiled! In astrology, Castor is counted a star of misfortune, and the specific association with breaking an arm or leg may come from the Ptolemaic classification of this as a Mercury star; a planet which is much associated with the arms, or the limbs generally. Castor is also noted in natal astrology for proneness to nervous breakdowns, and the author has often found it prominent on the horoscopes of his many clients in neurotic distress. But Castor’s Mercury quality does have a better side to it, as does all else counted ‘bad’ in this world of the heavens. People with it prominent and well aspected are exceptionally gifted intellectually, a good creative quality along with this – a bonus from the combination of intellectual Gemini Constellation and intuitive Cancer Sign. Where these potential geniuses often need help is in not letting their concern for others go ‘over the top’ beyond their own sensible state of responsibility and practical ability to help, the negative qualities of the combined Gemini-Cancer qualities. 1. Fixed Stars and Constellations in Astrology, Vivian E. Robson, 1923, p.46, 154. 3. Fixed Stars and Their Interpretation, Elsbeth Ebertin, 1971, p.33. 4. The Living Stars, Dr. Eric Morse, 1988, p.43. 5. The Fixed Star Health and Behavior Imbalance, Ted George and Barbara Parker, 1985, p.
i have a stellium there of mars(16:40 degrees), venus 17:24 degrees) and jupiter (19:53 degrees) in the 12th house. Castor in Cancer is an evil star especially if it is rising in the ascendant and opposition Uranus plus some squares. I found this star prominent in “The Angel of Death” chart: Josef Mengele the SS doctor. Neptune is conjunct both Castor and Pollux both evil stars. This dreadful doctor caused the deaths of thousands if not millions. He is perhaps the worst Nazi of all of Hitler’s troops. Neptune in Cancer has at least 9 aspects so the evil nature of Neptune is especially highlighted. Good information thank you Judith. I have some others listed in Nazi Horoscopes but that post is about Yod aspect patterns. I wish that theres more info for Mars conjunct Castor since I have it on 0 orb, conjunct Chiron. Thanks for citing your sources. Thanks for that again Jamie. You cannot really mean though though that one aspect in anyone’s chart paints the whole picture. However, the July 13th eclipse was opposite Pluto at 20.40 degrees. Now what did that mean for the world with the powerful Sun and Moon together ? ?